If you get electric service through GVEC, you’re not just a customer; you’re also a valued member-owner. You, along with GVEC’s thousands of other member-owners, hold an ownership stake in the Cooperative. This is why we distribute capital credits back to members at the discretion of the Board of Directors. But Cooperative membership presents other benefits as well. Because GVEC is structured and run as a democracy, one of those other benefits is a voice in how your Cooperative is governed. Having a voice in Cooperative business means having a vote. Your GVEC District Meeting is your opportunity to exercise that vote. At these meetings, members of the district discuss and conduct relevant business and nominate a Director-Candidate to be officially elected for a three-year term at our Annual Meeting. GVEC’s Board is made up of 11 directors and each plays an essential part in assuring the overall health and vitality of our Cooperative. They come from diverse backgrounds and a range of industries. They are deeply committed to their roles and invest considerable time in representing GVEC membership and in continually educating themselves to capably serve. They live and work in GVEC’s service territory, too, so they have a personal interest in ensuring the Cooperative runs efficiently and dependably. 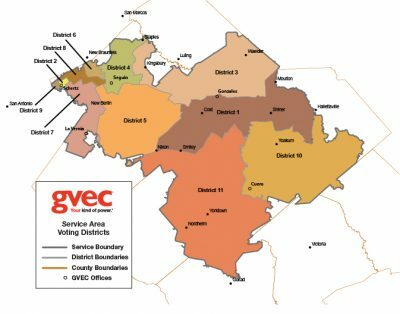 If you are not sure which district you live in, we have included a district map to illustrate how GVEC’s service territory is divided up, below. If your District Meeting will be held this year, look for a postcard notice in the mail and your local newspaper. Or you can call to confirm which GVEC District Meeting you should attend. These meetings are extremely important to the Cooperative’s day-to-day running and overall health—that’s why your vote matters and why I strongly encourage members in the above districts to attend. I hope to see you at your District Meeting.